On Sunday evening December 13, Catholic Athletes for Christ (CAC) will be hosting its fifth annual Courage Awards reception to recognize major league baseball’s Craig Stammen for his distinguished athletic achievement and also for boldly sharing the Catholic faith. The event also honors high school and college senior student-athletes in the Arlington (Va.) Diocese. The event will take place at Marymount University in Arlington, Va., beginning at 5:30 p.m. (click here for flyer). Tickets may also be purchased in advance (see below). 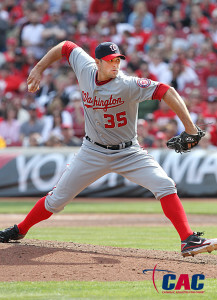 Stammen, a relief pitcher formerly with the Washington Nationals, is being honored for leading the Nationals Catholic ministry since his arrival to the team in 2009 and also serving the local Catholic community throughout his time in Washington, but especially in 2015 by speaking regularly to Catholic students at Arlington Diocese elementary and high schools. 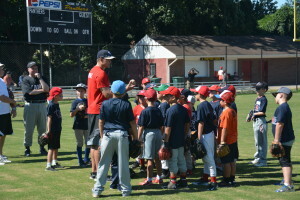 In addition, Craig was instrumental in the success of CAC’s Catholic Baseball Camp held at Paul VI High School on July 24. 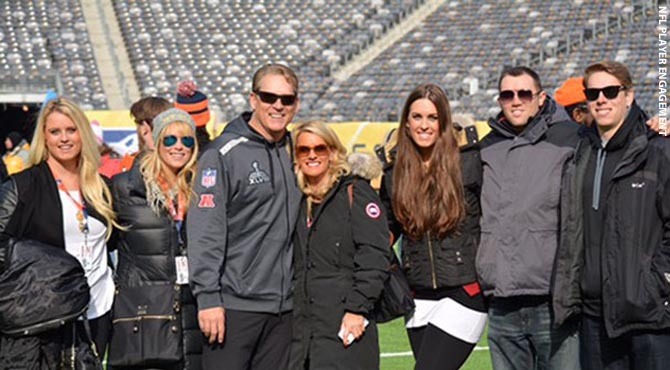 Craig suffered a season-ending injury in 2015 and used this opportunity to advance his evangelization efforts. CAC’s Board Member and NFL Outreach Coordinator Linda Del Rio was recently featured on NFL.com’s “NFL Wife Spotlight”. Click here to read Linda’s story and learn about the great service work that she is performing to assist the less fortunate. CAC’s President and Founder Ray McKenna was interviewed by Iowa Catholic Radio on September 4 to discuss CAC’s mission and Trent Beattie’s new book, Fit for Heaven, which highlights Catholic athletes and how they integrate their sporting lives with their deeply held Catholic beliefs. 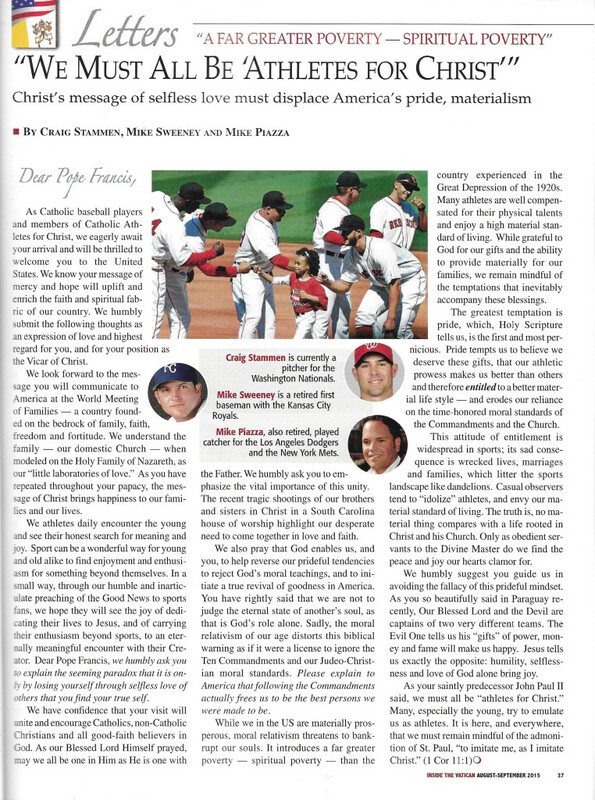 CAC MLB Athletes Welcome Pope Francis to the U.S.
CLICK HERE to read an article in the new issue of “Inside the Vatican” magazine, where three of CAC’s Major League Baseball (MLB) players — Mike Piazza, Craig Stammen, and Mike Sweeney — welcome Pope Francis on his upcoming visit to the United States and share their collective message of being “Athletes for Christ”. Congratulations to CAC’s Mike Sweeney on his induction into the Kansas City Royals Hall of Fame on August 15, 2015. Click here to watch video of Mike induction ceremony. 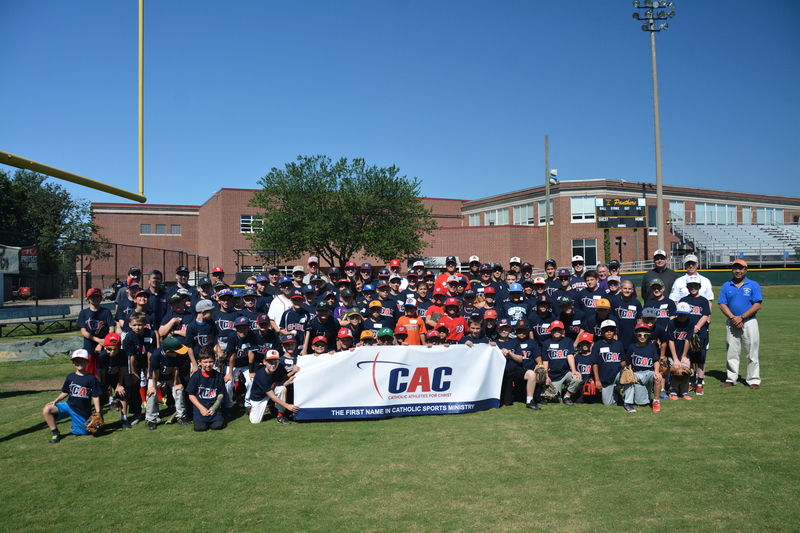 For photographs from the July 24 CAC Catholic Baseball Camp, click here. 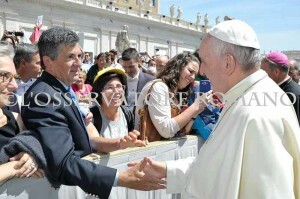 The camp was also covered by the Arlington Catholic Herald newspaper. Click here to read the article recapping the camp. CAC Summer 2015 E-Newsletter Now Available! Click here to read the new Summer 2015 issue of the CAC e-newsletter “Cathlete News”! More than 80 campers participated in the first CAC Catholic Baseball Camp in Fairfax, Va.
On July 24, more than 80 boys and girls from the Washington, D.C. metropolitan area participated in CAC’s Catholic Baseball Camp at Paul VI Catholic High School in Fairfax, Va. The day included Mass, talks/Q&A, and baseball instruction from current and former professional and collegiate baseball players. Washington Nationals pitcher Craig Stammen spoke to the campers after Mass about how his faith has influenced his life and his baseball career. Baseball instruction was led by Stammen, Tom Carroll (Cincinnati Reds), Jim Hannan (Washington Senators, Detroit Tigers, Milwaukee Brewers), Billy Emerson and Jeff Nolan (Paul VI High School), and members of the DC Padres priest/seminarian baseball team, led by Father Andrew Fisher (Arlington Diocese Liaison to CAC). CAC presented one camper who best exhibited love of God and love of Baseball with the Mike Sweeney, Sr. Courage Award. 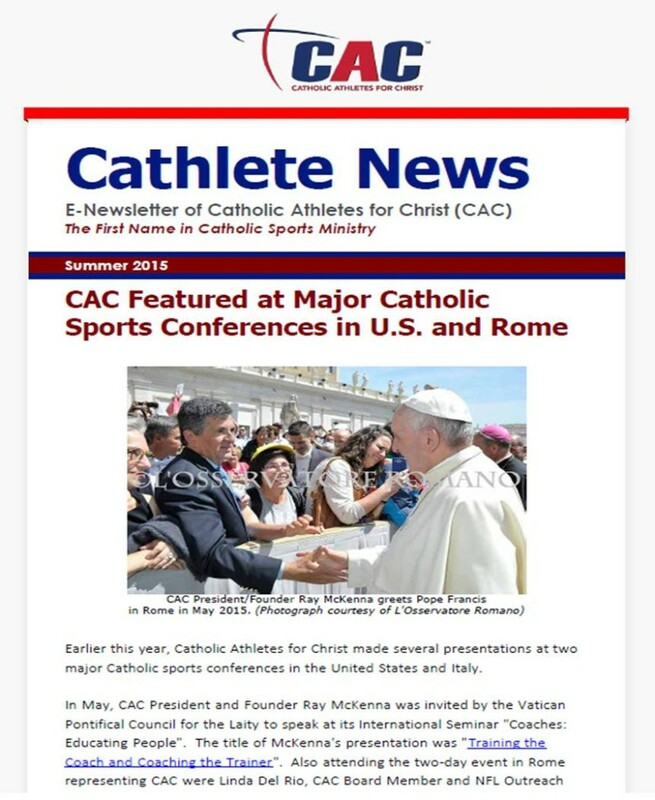 Earlier this year, Catholic Athletes for Christ (CAC) made several presentations at two major Catholic sports conferences in the United States and Italy. 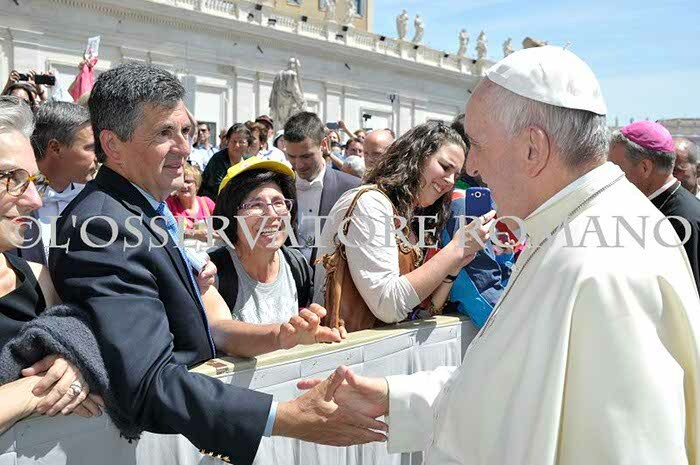 In May, CAC President and Founder Ray McKenna was invited by the Vatican Pontifical Council for the Laity to speak at its International Seminar “Coaches: Educating People”. The title of McKenna’s presentation was “Training the Coach and Coaching the Trainer“. Also attending the two-day event in Rome representing CAC were Linda Del Rio, CAC Board Member and NFL Outreach Coordinator, and Darrell Miller, former Major League Baseball player and currently MLB vice president of youth and facility development. In April, McKenna and CAC were featured at the 41st Conference on Value Inquiry: Sports and Values, hosted by Neumann University’s Institute for Sport, Spirituality, and Character Development located just outside of Philadelphia, Pa. At that conference, McKenna spoke on Sports, Values, and Societal Change. CAC Now Accepting Registrations for Catholic Baseball Camp on July 24 in Fairfax, Va.
Catholic Athletes for Christ (CAC) is hosting a one-day Catholic Baseball Camp on Friday, July 24 at Paul VI Catholic High School in Fairfax, Va.
Click here to register for the camp. Please be sure to complete all sections and required fields! The camp is open to ages 8-16 (boys and girls) and will run from 9:00 a.m. until 4:00 p.m. The cost for the camp is $50. 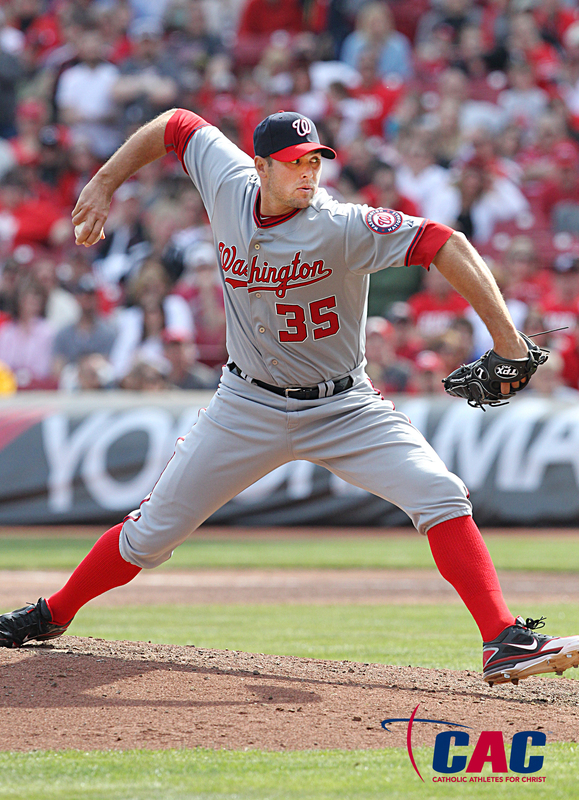 Washington Nationals pitcher Craig Stammen will appear, as well as former MLB players Tom Carroll (Cincinnati Reds), Jim Hannan (Washington Senators), and Fred Valentine (Washington Senators). In addition, priests, deacons, and seminarians on the DC Padres baseball team will assist in the instruction. The camp will include Mass held at the start of camp with confessions available, talks highlighting the Catholic Faith and vocations, instruction by former MLB players, and lunch.